One of my recent fixations lately is old records from the 60's in mono. While I haven't broken the bank buying dozens and dozens of them, I do want to start picking up the records and artists that I think are important to me. Though I haven't gotten around to reviewing it (mostly because I haven't made the time to take a bunch of pictures) I have the Beatles Mono Box set and I've been slowing picking up some of the old soul that I love. One of the best is Otis Redding. This year for Record Store Day, Otis Blue was rereleased as a double LP with one LP of the mono mix and one LP of the stereo mix. It was $45 dollars. Kind of insane, but I wanted it. When I arrived down at Vintage Vinyl, it was already sold out. While going through the non Record Store Day items, I stumbled across this. 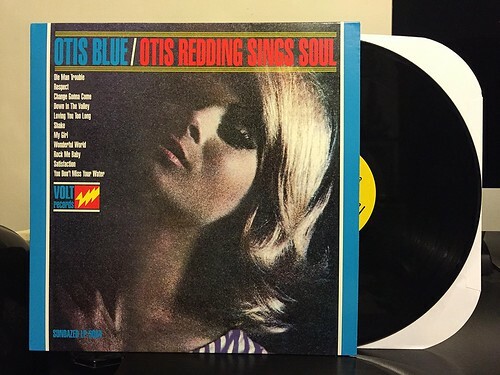 A version of Otis Blue, in mono that was released back in 2001. Honestly, I only really wanted the mono version anyway and this one was only $22. Buy! So many tremendous Otis Redding songs reside on this LP. "Loving You Too Long," "Respect," his killer version of Sam Cooke's "Shake" and Otis' take on The Rolling Stones' "Satisfaction" are just the start of the list of hits on this album. The record sounds very good and it's quite clear. A lot of people have beef with some of the reissues that have been released over the past few years, but it's not like used versions of this record in mono are cluttering up the dollar bins. For me, it's nice to have a good sounding, clean copy for the collection. You could argue if I should be writing about this in the context of Record Store Day. Sure, it wasn't one of the official releases, but I did buy it on Record Store Day, so to me, that makes it part of the haul. You should be writing about this even if it wasn't a RSD release. You bought it on RSD so that counts even more! It's also an essential record to have!